Starting Strong #025 -, How Can I Help You Improve Your Body? What's your biggest problem or frustration with exercise? Please let me know HERE! When you fill out that survey, you'll be entered into a drawing for free half-hour exercise consultation with me. We'll work on those issues that are specifically troubling you. I really want to give you the ability to change your body. I get so much pleasure from hearing about people who have been able to lose fat and build muscle using the info on this site. If you win, you'll get an e-mail by Thursday, March 1st! OK, check out the new article below about how the old timers built strength. They were tough old bastards, and they trained hard. 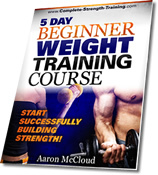 And of course, check out my 5 Day Beginner Weight Training Course if you want to get started lifting, or my The Complete Guide to How to Get Abs if you want to get ripped! "There is no such thing as a little man, and nothing is impossible." 2) Top Submission: Keeping Fit! Learn what old school weight lifting is all about. Lift like the old masters so you can become as strong as they were. I spend a lot of time lifting heavy weights and being active. But this also means that it's hard for me to eat delicious, high-quality, muscle-building food all the time. I spent a few days checking out all the foods in my local grocery store to find easy-to-prepare ones that are good on the go. And now I can just buy them and eat them. For example, I try to really get enough protein for my own muscle building efforts. I found a brand of Greek yogurt that I love (Fage, if you're interested), and now I buy tons of the stuff! It's easy to carry around, high in protein (complete animal proteins at that), and the calories are already measured out. I love it! Do the same for yogurt, cheeses, milk, and different brands of jerky or dried meats. These are easy to carry around, the calories are usually already measured out, and once you find a brand you like you can buy a ton of it. 2. …And Carry It Around! Seriously, carry that simple stuff around! Yogurt, cheese, and jerky are great for this, but fruits (and even some vegetables) work great for this too. When I'm busy I try to keep yogurt and a few apples and carrots in my backpack. They don't take up much room, and they're handy in a pinch. Choose a diet mentality that works for you when you're eating out. If you're busy all the time, you'll probably eat out sometimes. You won't be able to count your calories, and you'll have to have a general diet plan that works. Whether it's paleo or Ornish or Atkins or South Beach, choose a general philosophy. Or make up your own! Just eating out with the simple expectation of not eating crap will work great too. It also helps to remember that if you get full and don’t finish your restaurant plate, you are not wasting money – you are gaining a feeling of well-being and maybe even a doggie bag. I usually have one or two days a week when I'm at home. I use this time to get work (and laundry and dishes ;-) done, but also to prepare food for the coming week. It doesn't take me a ton of time or mental energy to bake some squash (easy to store in your fridge for the coming week) and make a big pitcher full of green tea. And get an idea for how busy the coming week will be, and what my eating will be like. I don't spend a ton of time obsessing about this stuff, but it pays to do a little planning. Plan, work hard, and it'll work. Starting Strong brings you the latest additions to Complete-Strength-Training.Com & select articles about how to get STRONG. If you like this e-zine, do a friend and me a big favor and share it with them. If a friend forwarded this to you and if you like what you read, please subscribe by visiting Starting Strong. Comments? Ideas? Feedback? I'd love to hear from you! Just reply to this e-zine and tell me what you think. Train hard, do your best, & see you next month!